The first approved polo helmet. 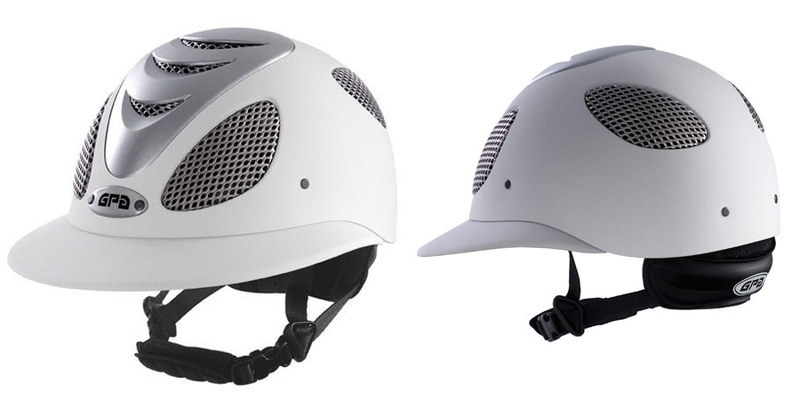 This ultra-ventilated helmet guarantees safety, sturdiness and lightness, has been adapted for the POLO. Wide visor/peak especially developed for Polo. The first approved polo helmet. 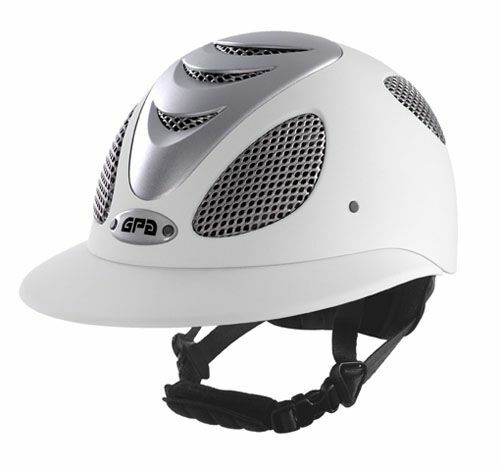 This ultra-ventilated helmet guarantees safety, sturdiness and lightness, has been adapted for the POLO. Wide visor/peak especially developed for Polo. Its technology is harnessed for total safety effectiveness. The head liner is removable, washable and interchangeable. Front air inlets also in heat-formed injected composite, inset in the crown. 3 wide vents for axial ventilation allow an additional penetration of air and create a linear depression which accelerates the air flow and favours heat transfer. These elliptical vents are also covered with stainless steel mesh. This designer helmet provides total rigidity as well as giving an impression of lightness. Outer shell: heat-formed injected composite. 2 very large side air vents in the front, 2 vents in the back creating a draught ensuring the optimal dynamic ventilation of the helmet. The hot air is evacuated naturally through the back.Each air vent is covered by a stainless steel mesh. Front part bears the GPA signature. Finish: high-tech paint that looks and feels like fabric. Visor fitted into the helmet. Designed to detach upon impact, reducing the risk of injury. Chin strap held on the helmet by 4 rivets. Adjustable nylon straps with double adjustment (adjustment triangle for front/back lengths balanced or uneven), a fast self-locking buckle (dual-lock) and an anatomically designed foam pad. Fitted to the back band. The nape protector is anatomically designed. Not fixed to the helmet, fixed on the harness of the chin strap to allow the ideal positioning of the helmet and ventilation of the back of the neck. A cushion of thick foam padding covered by black PVC fabric with the GPA signature. Foam padding removable and replaceable. Head liner in "aerated" foam covered by high-tech antibacterial fabric. Made up of 4 independent parts (front, central, right and left). Ideal balance between the helmets inner volume and the volume of the outer shell which creates a perfect aesthetic harmony whatever the shape of the head.